Obama begins the research phase of planning his Presidential Library. First up, a full scale replica of the great sphinx with his likeness. Hey, now THERE is a shovel-ready project! Can we take this to replace the statue of Liberty. This would be a better fit for the America i am creating. Yeah, my face should go right there…. One of the great wonders. One of the great blunders. So, if I hit it real hard in the shoulder here, will it crumble like the U.S. economy has? Now, guys, this is what my monument is supposed to look like. None of that pantywaist Washington, Jefferson, Lincoln stuff. Naw, this won’t do. More columns! Can we add more columns? Damn, those Jews sure made good slaves. Between Barack and a hard face. Cut! cut! I said I was going to be Moses in this one. I thought I was suppossed to go to the Valley of the Kings. So the false-fuhrer, Muhummud, came to the pyramids. Well …. 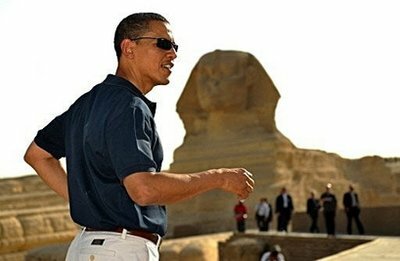 the murtadd-messiah, Hussein, to the sphinx, then. Recall Colonel Tillman. Gotta get the angle right. Tomorrow we’re gunna retake this from one of the VC-25s! Is this where Mussolini, upon whom my modified Marxism is modeled, stood? “An ostrich with its head in the sand is just as blind to opportunity as to disaster” and the same holds true for presidents. One can only hope that during his visit to Egypt Obama reflected on the words of Milton Friedman: “If you put the federal government in charge of the Sahara Desert, in 5 years there’d be a shortage of sand”. Forget the Roman columns, this will be my next backdrop for 2012. Watch as I drive these little people into the sand with nothing but my fist! I AM AMAZING!! Two bigs heads but neither one makes it to any ‘Wonders of The World’ list. I dreamed I saw the Sphinx in my Maidenform bra. Hey, let’s get a picture of Air Force One flying over this! Wha…, tell those camels to get a tent! Thanks for having me. It is truly an honor to be at this historic place where both Egyptian and Jews worked together to create such historic pieces of world renown art. 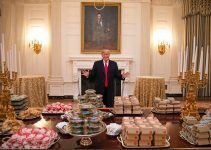 Noone in my families’ recent history has ever stood before such an awe inspiring sight, although my uncle did help free Buchenwald. It is also rumored that one of my ancestors was in fact a Pharoah and that is why the Sphinx bears an uncanny likeness to me. I am shocked that I can stand before a crowd of the decendants of the families my own ancestors used to be ruler of. I know I know there are some who are startled to find out that my ancestors once ruled your ancestors but it is no suprise to me and I wont hold it against you. A great document starts out We the people and continues on to say that everyone is endowed by Allah with certain rights. Rights which America in the past has failed to provide to everyone and I am trying to make sure that America is living up to its founding principles. But both sides have a point to be made. Those who are for torture state they want to keep America safe from attacks by what is in reality only a very very few individuals who by the way also have not given any money to the RNC. Those who are against torture wants everyone in the world to suceed and to live happily ever after in peace, harmony, and joy. (b.) But on the other hand…. But traditional battle lines can contain a great many nuanced positions and we need to find common ground. Such as only torturing people who didnt vote for me. After all, if I can deign to this land my ancestors once ruled and speak to people whose ancestors were but dust upon the feet of my ancestors than I think that we can make anything happen. But we cant expect those who voted against me to change their mind overnight. Therefore their torture will continue until morale improves. Wuth all that being said just think. If you were the descendants of Pharoahs than you too could become President of the US. But only after I am dead as I plan to be there for a long long time. Tell Michelle to get into that Hijab and get out here now so we can get the photo on the cover of Vogue. This is the fashion statement we have to make. Oopps didnt delete everything from Daily beast. Has anyone found the codpiece of the Staff of Rahm? Okay who hid the teleprompter? They didn’t get my nose right.